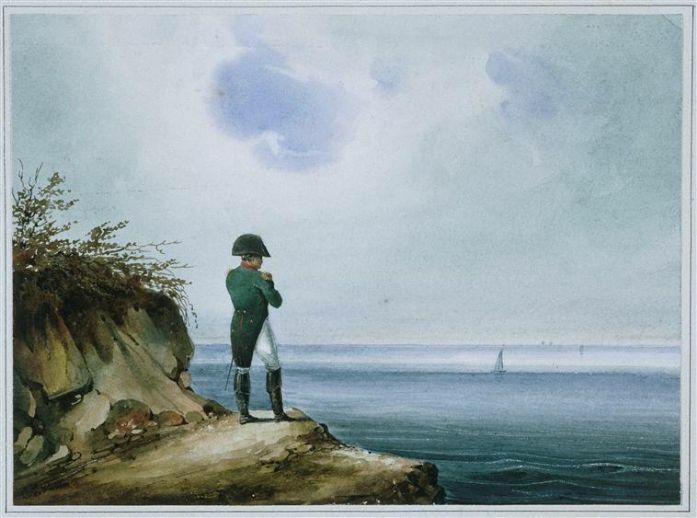 The news of the death of Napoleon on St Helena on the 5th May 1821, arrived in St Ives on July 7th. The news had been received in London on July 4th and was carried by the Morning Post on the 5th. A generation of people in West Cornwall had grown up during the series of wars between the old enemies, England and France, culminating in the Revolutionary Wars in the 1790s and then the Napoleonic Wars of 1803 to the battle of Waterloo in 1815. To them it must have seemed that the wars were now truly over. Although many of the confrontations and battles took place abroad, the wars had a considerable impact on people’s lives in Cornwall. England had been forced off the gold standard and suffered some inflation. Taxes were high and food prices rising and to survive, many men volunteered for the army; many were conscripted. Being a busy port with many employed in the fishing and coastal ships, Penzance was a likely target for the navy and when a man o’war arrived in the Bay, for example, young men in Newlyn hid in local mines to escape the naval press gang. On the other hand a naval career was very attractive to some and a local man, Pellew, became an admiral and colleague of Nelson (not to mention a major character in C.S. Forester's Hornblower series). Parish councils had to deal with numerous injured men trying to make their way home to West Cornwall. The deep fears of the British government that revolutionary ideas would spread from France to Britain, led to laws restricting any rights of working people. Spies were imagined everywhere, so that the Lord Lieutenant of Cornwall gave instructions that anyone seen walking on the cliffs with no obvious reason, should be investigated. This may have caused some confusion, as richer people from up country, unable to holiday in France, were beginning to form the tourist industry in Cornwall. There was a strong fear of invasion all along the south coast and Mounts Bay was surrounded by gun batteries, whose ranges overlapped and covered the entire Bay. In the event, the only French seen by the people of Penzance were on a ship coming home from the war in Spain that stopped in Mounts Bay, bringing prisoners of war. Small boats took large numbers of local people out to view these fearsome enemies from a safe distance. By 1821, however, although the death of Napoleon marked the end of an era, it is difficult to know how notable it was for the people of West Cornwall who were suffering from the post-Napoleonic depression, as the economy tried to adjust to the change to peace. Political changes were underway through the first serious plans to do something about the rotten boroughs in Cornwall and elsewhere and the introduction of the Corn Laws. The old system of poor relief was under great strain while the improvements in health led to an increasing population. Everything seemed to be changing. Just two months after his death, came the amazing coronation of George IV, who – despite the fact that Napoleon no longer existed – spent a fortune (or ran up tremendous debts) on a spectacular occasion, specifically designed to far outshine Napoleon’s own coronation some years earlier, even copying and improving his robes. The long shadow of Napoleon is still with us, buildings, streets and other structures named from our success, such as Waterloo Bridge in London, and Wellington Place in Penzance, built in 1815. The houses of Parliament are lined with huge paintings of our victories, which have recently – and embarrassingly – been shown proudly to a visiting French president.